A streamlined, more affordable version of the original Tekton 7-Ball design. 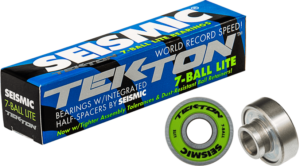 Seismic® Tekton LITE bearings feature flat contact surfaces at the ends of integrated half-spacers. The flanges square up, co-align and self-stabilize inside your wheels – correcting for flaws in bearing seat levelness, bearing seat spacing, axle diameter and axle straightness. Your wheels roll faster with better control, while the bearings last longer and stay quieter. Other features include: top-grade P4 steel balls, nylon retainers, black outer casing, removable rubber-coated steel seals with printed graphic, and high-end Japanese Kyodo grease. Construction meets or exceeds requirements for ABEC-7 rating. The inner race is stepped underneath the seal to resist contamination, and it’s stepped between the bearing and the flange to save weight. On the side opposite the flange, the inner race extends 0.5mm to form a thin integrated washer. No bearing spacers or axle washers required! Patented design integrates wide, flat contact surfaces on ends of custom-machined half-spacers. Broad flanges square up, co-align, and self-stabilize inside wheels. Corrects for flaws in bearing seat levelness and spacing / axle diameter and straightness. Self-straightening: Prevents bearings from sitting or rocking out of alignment better than any other system. Self-supporting: Protects bearings from internal stresses. Packed with premium “high RPM” light grease, formulated by one of the world’s most renowned lubricant suppliers. Inner race specially contoured underneath seal to resist contamination, and stepped between bearing and flange to save weight. Extends 0.5mm on side opposite flange to form thin integrated washer. Retainers made of Dupont engineering-grade Nylon for superior durability. Degree of play engineered for balanced performance and wear across all skating disciplines. Not too much, not too little. Balls rated P4, the highest grade available. Superior concentricity, surface smoothness, speed and durability. 6-Ball Tektons constructed with fewer, larger, stronger balls. Less total ball-raceway surface contact, less friction, quicker acceleration. Ceramic Tektons feature lightweight, rustproof trisilicon tetranitride (Si3N4) balls. Lighter, tougher balls mean less friction, quicker acceleration, more speed! Harder than steel, black ceramic crushes debris, keeps raceways clean. Runs cooler, too. When pressing your bearings into the wheels, use a proper skate tool, and be firm but not rough. Otherwise you can easily damage the seals and cages. Tighten all wheel nuts snug against the Tektons. Otherwise your wheels will lurch on the axles every time you carve or slide. This can easily damage the bearings as they slam back-and-forth against the hanger and the nut. If you have trouble getting your bearings on or off the axles, the axle diameter is probably too thick or irregular. This is more common with so-called “precision” trucks, whose axles may be ground with diameters too close to 8.0mm or 10.0mm. Usually all it takes to correct minor fit issues is some light sanding on the axle and/or the bearing bore. The inner race of standard skateboard bearings has an inner diameter of 8.0mm, with a small manufacturing tolerance. For greatest wheel and bearing precision, axles should have a diameter of around 7.95mm – 7.97mm. Avoid trucks with axles that claim to be exactly 8.0mm in diameter. Bearings may not fit on them, or they may get stuck after installation. Similarly, for 10mm bearings, axles should have a diameter slightly under 10.0mm. Otherwise the bearings are likely to have fit issues. NOTE: The broad Tekton flanges may not fit hub-less streetboard wheels with old-style, oversized bearing supports, which sometimes leave the wheel’s central hole smaller than the flange (15mm in diameter). Use Tekton LITE bearings for wheels of this type. Seismic Tekton bearings are manufactured to exacting standards and come pre-lubricated with a proprietary blend of oil and grease. A lot of myths have begun circulating about how often bearings need to be cleaned and re-lubricated. There is no need to clean or add any additional lubricant to new Tekton bearings. We recommend wiping excess grime off the outer seals every week or two. Clean and re-lube the bearings only as necessary, depending on how much you ride and the conditions that you ride in. Clean and re-lube more frequently if you ride through water, mud or sand. Avoid excessive cleaning, as this increases the risk of accidental damage to the seals and cages. Please note, too, that the inside face of the Tektons is unsealed. This means you can clean and re-lube without removing the rubber-coated steel seals on the outside. Just soak the bearings, rinse, and let dry. We recommend cleaning with isopropyl alcohol (70% solution or greater), denatured alcohol, Gumout® carburetor cleaner, or acetone. A variety of good lubricants are readily available, such as Bones Speed Cream. Avoid lubricant products that include citrus-based cleaning agents, since their acidic content can lead to corrosion. If you choose to remove the seals, be extremely careful when removing and replacing them. Do not use large hand tools or excess force, as this can damage the seals and even the ball retainers. Bent seals may not properly re-seat and can pop off during use. The bent sections can also have friction with the balls and lead to diminished speed. Damaged or cracked ball retainers compromise bearing performance even more seriously. Note that Seismic cannot warranty bearings that are damaged during disassembly or reassembly. Finally, please do not remove the ball cages from the outer casings – there is no need to take this step to clean your bearings. The plastic cages are quite vulnerable to snapping when popped out and back in. And outside of a professional bearing factory, it is nearly impossible to precisely reassemble bearings that have been completely disassembled in this manner. Deep-groove bearing designs inevitably make a small amount of noise. This may be more noticeable in the Tektons due to their single-seal design. This slight noise is irrelevant to performance and is actually a sign of a well-spaced assembly. In addition, bearings lubricated with oil or a lighter oil-grease mixture, such as the Tektons, are often noisier than bearings lubricated with thick grease. In our opinion, this is a small price to pay for the added speed that a lighter lubricant brings. Dust, dirt, and grime can obviously muck up the bearings’ inner works and cause noise, too. Clean and re-lube your bearings as necessary. Just be very careful not to bend the seals or damage the cages when you disassemble and reassemble your bearings, or when you install and remove them from the wheels. This is another common cause of noisy, diminished performance. Free-spinning bearings or wheels by hand, under zero load, is not a true or meaningful test of bearing performance. Advanced lubricants, such as those used in Tekton bearings, are designed to perform best when “warmed up” by real-world stresses. Bearings that are under-lubricated, or lubricated with very thin oil, may have a long free-spin. The same may be true of bearings with sloppy assembly tolerances. But during actual riding they won’t perform as well or hold up as long. Bearings with good assembly tolerances and high-quality lubricant are usually FASTER during actual skating, even though they may have a shorter free-spin. In fact, most world speed records have been set on bearings with modest free-spin. All that really matters is how bearings handle under the load of bodyweight – rolling, turning, and sliding on real roads. For all of the above reasons, we do not normally warranty Tekton bearings that free-spin less than a rider expects. Free-spin time truly has no significance (unless of course the bearing is absolutely locked or frozen). Bearing play stems primarily from two sources in combination: 1) a necessary tolerance between the axle’s outer diameter and the bearing’s inner diameter (axle tolerance); and 2) a necessary tolerance between the bearing balls and the groove or raceway (raceway tolerance). Many myths are circulating in the longboard world about bearing play. A properly functioning bearing requires some play of both kinds. It is a mistake to assume that “the less play the better.” Also, during actual rolling motion, the momentum of the balls tends to minimize axial play compared to what is observable when the bearings are at rest. Seismic Tekton bearings are designed to correct for most sources of misalignment. However, all 8mm bearings have play on standard 5/16-inch (7.9375mm) axles. This is simple mechanics, not an issue of bearing design or quality. Even higher-precision axles have minute high and low spots that add to play, depending on how the bearings’ inner races are “clocked” on the axle when the wheel nuts are tightened down. For greatest wheel and bearing precision, use trucks that have axles around 7.95mm – 7.97mm in diameter. Avoid trucks with axles that claim to be exactly 8.0mm in diameter – bearings are likely to get stuck on them. Inside an individual bearing, a small amount of play between the inner race and the outer casing is the result of a necessary tolerance between the balls and the raceway. Minimizing the gap between the balls and the groove decreases internal play, but it also increases friction, reduces speed, and shortens bearing life. Loose bearings (with a lot of internal play) are more durable, but they result in wheels that roll less precisely, which compromises grip and sliding characteristics. Tight bearings (with very little internal play) are slower and prone to damage. Optimal bearing performance is a matter of engineering the appropriate amount of internal play. Not too much and not too little. Furthermore, over time bearing lubricant evaporates and spins out, particularly if very light oil is used or if one side of the bearing is unsealed. As this happens, the gap between the balls and the grooves grows larger, since less lubricant is present. In turn, the amount of internal play increases, possibly to the point of compromising wheel performance. Clean and re-lube your bearings as necessary. It goes without saying that bearings damaged during cleaning (bent seals or cages) may exhibit excess play, as well as noisy, diminished performance. Also, like any other product, bearings naturally wear and degrade over time, particularly if ridden intensively. Other factors that contribute to bearing play include variations in the ID of the bearing seats. During production, they may shrink more on one side of the wheel hub than the other. Even a properly assembled and mounted wheel with high-quality bearings has at least 0.15-degrees of play on a standard axle. But for most bearings under load, 1 degree of torsional deviation between the inner race and outer casing will cause damage resulting in loss of speed and increased noise. Beyond poor axle tolerances, a number of other factors can easily contribute to this type of damage: loose axle nuts; absence of spacer support between the two bearings in a given wheel; and crooked or flexible bearing pockets in the wheel hubs. The effect of loose axle nuts should not be underestimated. Wheels that are not snugly fastened are free to lurch onto the threaded portions of the axles, which have a substantially smaller diameter. In turn, this creates a significantly higher potential for excess play leading to permanent bearing damage and slow, noisy bearing performance. Many so-called 10mm axles have an Outer Diameter in the range of 9.85mm – 9.957mm. The 10mm Tektons have an Inner Diameter spec in the range of 9.97mm – 9.99mm, for greatest precision with the best 10mm axles. They have more play on lower-grade 10mm axles.